Sir James Frazer (1854-1941) is best remembered today for The Golden Bough, widely considered to be one of the most important early texts in the fields of psychology and anthropology. 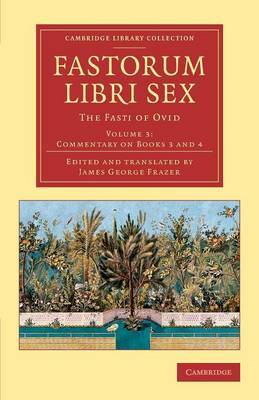 Originally a classical scholar, Frazer also published this five-volume edition of Ovid's Fasti in 1929. It contains the text and a parallel English translation, with commentary on the six books, indexes, illustrations, and plans. Frazer's interest in Ovid's unfinished final poem arose from his wide-ranging studies of ancient literature and the origins of myth. The work describes the origins of the Roman calendar with its sacred days, and ranges from the deeds of major gods and heroes to the strange rites involved in placating the goddess of mildew. Volume 3 contains Frazer's commentary on Books III and IV, dealing with the Roman months of March and April. Other works by Frazer are also reissued in the Cambridge Library Collection.